John Keats, an English poet, became known as one of the premier poets of the English Romantic movement during the early nineteenth century. Despite his very short life and constant critical attacks from periodicals of the day, he has, posthumously, been very influential on poets such as Alfred Tennyson and Wilfred Owen. 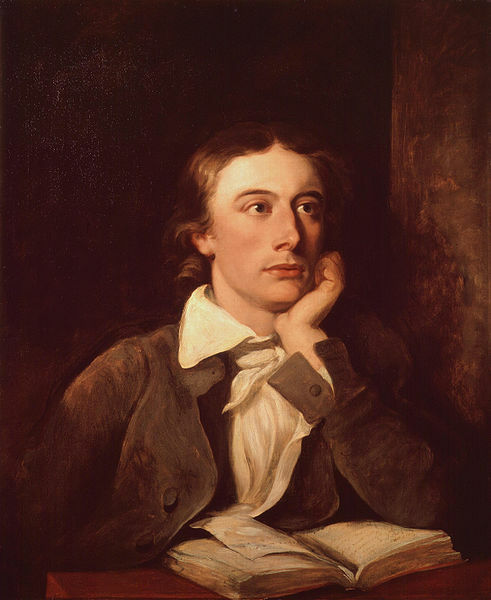 Keats’ poetry, characterized by elaborate word choice and sensual imagery, included a series of odes that were his masterpieces and which remain among the most popular poems in English literature. John Keats was born in 1795 at 85 Moorgate in London, England. Keats was baptized at St. Botolph-without-Bishopsgate and happily lived there for the first seven years of his life. The trouble began in 1804, when his father died of a fractured skull after falling from his horse. His mother, Frances Jennings Keats, quickly remarried but soon left her new husband and moved herself and her four children into the home of Alice Jennings, Keats’ grandmother. The school Keats attended there first instilled in him a love of literature. In 1810, Keats’ world was disrupted once again when his mother died of tuberculosis, leaving him and his siblings in the custody of their grandmother who subsequently appointed two guardians to take care of her new “charges”. They removed Keats from his old school in order to become a surgeon’s apprentice at Thomas Hammond’s apothecary shop in Edmonton. He left his apprenticeship in 1814, after a fight with his master, and became a student. During that year, he devoted increasingly greater amounts of his time to his real love, the study of literature. During this time that Keats authored parts of Hyperion and the five-act poetic tragedy Otho The Great as well asIsabella, St. Agnes’ Eve and Lamia. His brother, Tom Keats, was entrusted to his care following the death of their grandmother. Tom was suffering, as their mother had, from tuberculosis. Keats left to walk in Scotland and Ireland with his friend Charles Armitage Brown, having finished his epic poem, Endymion, but he too began to show signs of tuberculosis infection, and returned prematurely from his trip. Upon his return, he found that Tom’s condition had deteriorated, and on February 23, 1821, Tom died of tuberculosis. John Keats moved again, this time to live in Brown’s house in Hampstead, next to Hampstead Heath. He lived next door to Fanny Brawne, who lived there with her mother. He quickly fell in love with Fanny; however, it was overall an unhappy affair for the poet. This relationship was cut short quickly when, by 1820, Keats began showing serious signs of tuberculosis, the disease that had plagued his family. He left London’s cold weather behind and moved to Italy with his friend Joseph Severn, on the advice of his doctors. Keats moved into a house, now a museum dedicated to his life and work known as The Keats-Shelley House, which is on the Spanish Steps in Rome, where, despite attentive care from Severn and Dr. John Clark, the poet’s health rapidly deteriorated. John Keats died in 1821 and was buried in the Protestant Cemetery, Rome. His last request was to be buried under a tombstone reading, “Here lies One Whose Name were writ in Water.” His instructions were explicit that his name was not to appear on the stone. Despite these deathbed requests, however, Severn and Brown also added the epitaph: “This Grave contains all that was mortal, of a young English poet, who on his Death Bed, in the Bitterness of his heart, at the Malicious Power of his enemies, desired these words to be Engraven on his Tomb Stone” along with the image of a lyre with broken strings.